Institute Commission report outlines commitment and new approach to lifelong engagement with learners of all ages. 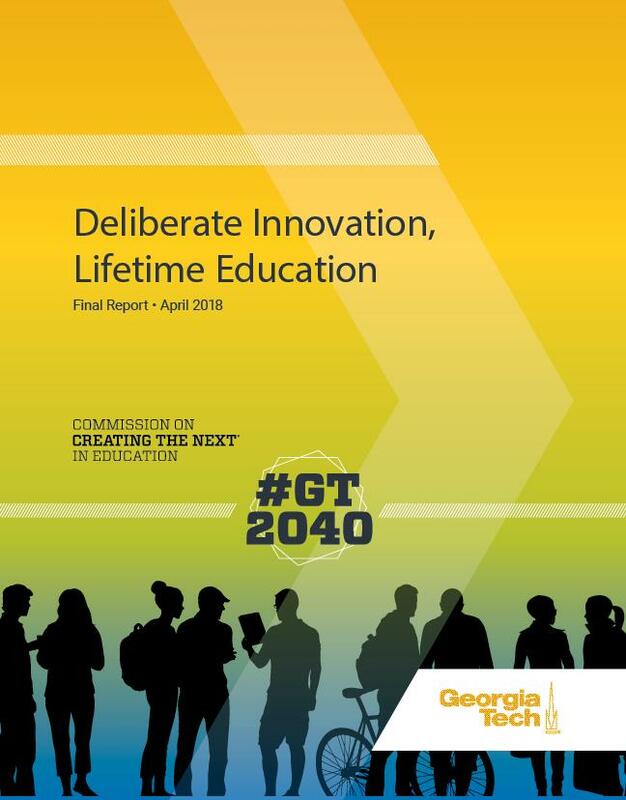 The Georgia Institute of Technology announces the official release of Deliberate Innovation, Lifetime Education, a report based on input and recommendations from the Commission on Creating the Next in Education, an Institute-wide commission of more than 50 faculty, staff, and students. Using the year 2040 as a long-term vantage point, the Commission was asked to explore and evaluate innovative approaches to higher education, and address issues facing current and future students. The group was also tasked with making recommendations on alternative educational models that reduce costs, improve the effectiveness of current methodologies, and increase opportunities and accessibility to serve the needs of the next generation and beyond. The Commission was convened in late 2015 by Provost Rafael L. Bras and co-chaired by Richard DeMillo, executive director of Georgia Tech’s Center for 21st Century Universities; and Bonnie Ferri, vice provost for Graduate Education and Faculty Development. The overarching recommendation of the Commission is a proposal called the Georgia Tech Commitment to a Lifetime Education. The proposed commitment is a promise to students to provide an educational experience that is highly individualized and sustainable for a lifetime. The Commission recommends five initiatives aimed at closing knowledge gaps, prototyping new products and services, and building critical technological infrastructure to achieve the vision of a lifetime education. Developing New Products and Services. Reinventing Advising for a New Era. Introducing Artificial Intelligence and Personalization Technologies. Deploying a Distributed Worldwide Presence. These initiatives will result in new models of teaching and advising; new curricular models that support episodic educational experiences attuned to the needs of 21st century workplaces; a data backbone to enable predictive analytics that improve educational decisions and outcomes; and the integration of technology-enhanced coaches, mentors, and guides to help students navigate more complex educational pathways. The Commission recommends a systems approach to growing Georgia Tech’s capacity for educational innovation, as all ideas imagined in the report are predicated on a culture change across the institution. This reshaping would fuse research and educational cultures into a single, immersive culture of innovation. Provost Bras will host a town hall discussion and moderate a panel of Commission members on April 25 at 1 p.m. in the East Architecture Auditorium. Town hall attendees will have an opportunity to ask questions of the Commission leadership and will hear next steps on the formation of implementation groups. The formation of formal implementation groups is forthcoming and will provide the basis for working groups on topics such as business models for new educational products and services, building a deliberately innovative culture, realizing the Georgia Tech Commitment to a Lifetime Education, and initiative execution. Stream the town hall and read the report at gatech.edu/ed-innovation. 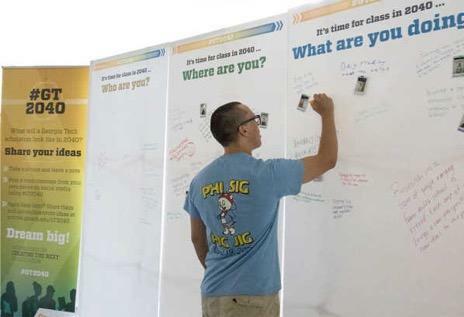 A Georgia Tech student participates in the #GT2040 installation activity as part of the Commission on Creating the Next in Education.